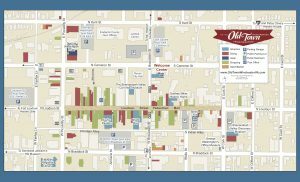 Old Town Winchester enjoys abundant, convenient, inexpensive parking and has approximately 2,000 convenient parking spaces either on streets, in parking lots, or in four downtown garages all accessible 24/7. Most parking meters in the downtown are $0.75 an hour. Meter enforcement hours are from 9 a.m. – 6 p.m. Monday – Friday. Parking is FREE at meters after 6 p.m., Saturdays, Sundays and most holidays. Meters accept quarters or pay by cell through the Parkmobile App. All four parking garages, or autoparks are fully-automated and offer covered parking. The Court Square, George Washington, and Loudoun Autoparks offer parking at $0.50 an hour with a maximum daily rate of $10. The Braddock Autopark offers parking at $1.00 an hour with a maximum daily rate of $10. Long term parking passes are available for a monthly rate for the parking garages. For more information about parking contact the Parking Authority at (540)722-7575 or view the Winchester Parking Authority web pages. Bus parking is also available in Old Town Winchester. Currently there is one permanent bus parking spot on the North side of W. Cork Street adjacent to the George Washington Office Museum and one one the South side adjacent to the Shenandoah Valley Discovery Museum. For additional temporary bus parking contact the Parking Authority. All of downtown’s 586 meters have the Pay by Cell option (on-street and in lots). For more information visit: http://www.winchesterva.gov/parking/pay-by-cell. Parking meters will still accept coins and most cost $0.75 per hour. With Parkmobile, customers can pay by cell instead of looking for quarters to feed the meter. Customers also have the option to extend their stay through the Parkmobile app instead of having to return to the meter. A $0.40 convenience fee is charged per transaction. Customers can pay for parking on their mobile devices using Parkmobile’s mobile applications for iPhone, Android and Windows 7. Additionally, customers can use Masterpass, PayPal, Visa Checkout, Chase Pay, Parkmobile Wallet, and coming soon – Apple Pay, to pay for parking.